If nothing else, the news of massive snowstorms in China – the worst in 50 years - with the reported deaths of at least 50 people and massive economic disruption, should remind us that the effects of cold weather are rather more serious than the supposed impact of global warming. 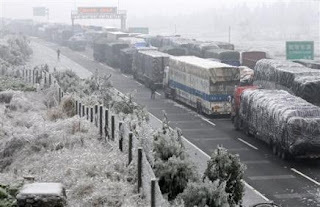 Not least, the mobilisation of 460,000 troops from the People's Liberation Army and paramilitary forces, to deal with the crisis, points up the devastating impact of this bad weather. The most alarming news is that there have been sharp rises in food prices, adding to inflation that is already at 11-year highs. This is, we are told, causing concern in Beijing as inflation has historically caused social unrest, something we pointed out at the end of last year. One can take great delight, however, in watching the "warmists" squirm, Reuters reporting that "scientists" have been quick to rush into the breach, declaring that the snow storms are not directly linked to climate change. Merely, they are "an extreme event caused" by very cold winter temperatures and a La Nina weather pattern. We have yet to experience any snow storms caused by very warm temperatures, but we'll let that one pass. According to Dong Wenjie of the National Climate Centre, La Nina has brought moist air over southern China at a time of very cold winter temperatures, resulting in heavy snow falls. This, he says, "is mainly related to abnormal atmospheric circulation and the La Nina event." Dong adds that the National Climate Centre predicts that this La Nina event will continue at least up to summer 2008 at a medium to strong level," then pronouncing that, "With climate warming, extreme weather events are clearly increasing in frequency and intensity." Australian climate scientist Penny Whetton, one of the authors of the UN's Intergovernmental Panel on Climate Change (IPCC) fourth assessment report, backs up the Chinese explanation for the storms, herself venturing the view that the bad weather was not linked to climate change. "Those conditions are things that occur naturally and so every few years, few decades, everything just comes together right to produce an extreme event." She adds: "My guess is this is a natural event without any particular reason to link it to climate change. The climate change models are not predicting increases in snow events like this." However, she could not leave it there. China, she said, could expect a less stable climate because of global warming, with various regions experiencing drier, wetter, hotter conditions, as well as more intense tropical storms. "Cold extremes are generally not predicted to become more intense and frequent because we have a warming climate." Now enter David Jones, head of climate analysis at Australia's National Climate Centre. "We are seeing that in places like northern Canada, where there's been almost a doubling of rain and snow in the last few decades, and that's exactly what you expect cold polar desert regions to become, a lot wetter in a warmer world," he says. 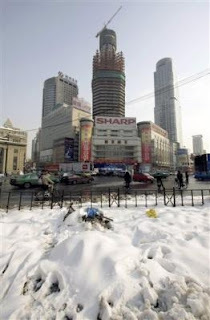 Jones also says that China's snow storms could not be directly linked to climate change, unlike floods, heat waves and fires that are a result of rising world temperatures and rainfall. "Winter is a time of year in the northern hemisphere where you often get these extreme events. We have always had them and we will always have them," he adds. Then, completing the confusion, he tells us: "Not only are we moving into a hotter world but a different world … You get more and more surprises as the world changes, because you are moving into a world where the atmosphere and climate just doesn't behave like it used to." So, this isn't global warming but then, perhaps it is. Do you get the impression they don’t know quite whether they are coming of going? Only EUObserver has bothered to report the fact that after several years of unpleasantness the Belgian police have dropped their case against the Stern journalist Hans Martin Tillack. We have followed the story since 2004 and here is the link to all of the postings, so our readers, should they wish to, can read them in order. The Belgian police have said they will return almost a thousand pages of documents to a former Brussels journalist, ending a years-long saga that was judged a violation of freedom of expression by the European Court of Human Rights. On Wednesday (30 January), Belgian police commissioner Philippe Charlier informed the Brussels office of German news magazine Stern that the documents confiscated in 2004 will be returned. Well, that’s nice. On top of that the Belgian authorities have agreed to abide by the instructions of the European Court of Human Rights and pay “€10,000 for "moral damages" as well as €30,000 in costs”. Mr Tillack said that he would donate the €10,000 to the relief fund of the International Federation of Journalists who had supported him in his travails. Excuse me? Global culture of human rights and civil liberties that has existed for almost 60 years? Those 60 years saw, among other developments, Stalin’s second purge, the Communist purges in Eastern Europe, the murder of many millions of Chinese under Mao’s regime (and if there is a culture of human rights and civil liberties in China, I must have missed it), the rule of Ho Chi Minh in Vietnam and of the Khmer Rouge in Cambodia, not to mentionKim Il-Sung and Kim Jong-Il in North Korea. Those 60 years saw the devastation of one African state after another to the point where human rights and civil liberties are not words most of the unfortunate people of that Continent can even begin to understand. Those 60 years saw the rule of the two Assads and of Saddam Hussein, not to mention other tyrants in the Middle East and the Gulf region. Shall I go on? Well, yes, the last couple of years saw a rapid movement back into autocracy in Russia, temporarily, we hope, in Ukraine, more permanently in Belarus, Moldova, Kazakhstan and all the other stans. It seems the murder of Gongadze in Ukraine and the near murder of Anna Politkovskaya in Russia (to pluck two cases at random – there are many more) are not a challenge, devastating or otherwise to human rights or civil liberties, as established nearly 60 years ago. None of that matters except for the war on terror even though Anna Politkovskaya has, in fact, been murdered, as have several other Russian journalists. Considering that the IFJ has spent all this time simply helping Mr Tillack’s get his papers back (and he has not yet been given them, merely promised), the Federation’s ability to aid and defend its own is limited. Its notion of how to tell the world about the Russian government’s treatment of the media is to hold a conference in Moscow. Apparently the organizers are indifferent to the sort of impression that might create in the remote possibility of anybody apart from World Politics Review noticing it. Apart from all that, one wishes Hans Martin Tillack well. One would, however, like to know what his opinion about the European Union is now. At the beginning of this whole mess, as I recall, he was a europhiliac and was rather shocked that he, a supporter of the project who wished to see it reform itself in order to appear more attractive to the people of Europe, should have been treated in such a dastardly fashion. Has he progressed from that position at all? So, Dan Hannan has got kicked out of the EPP group in the EU Parliament – an ironic twist as it is an organisation he never wanted to be part of and always vowed he would never join. His "crime", written up by Conservative Home and England Expects, was to question the increasingly arbitrary use of powers by the parliament's president, Hans Gert-Pöttering. 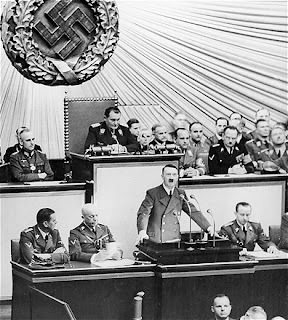 Hannan compared his willingness to override the parliament's own rules with Hitler's 1933 Enabling Act which gave him the power to override the German parliament and constitution. On the other hand, we saw recently Sir Nicolas Winterton compare Brown’s guillotine of the Lisbon ratification as, "an abuse of the House," which "…would not have been untypical of Nazi Germany or the Soviet Union." This got not even the slightest murmur from the Speaker and, as far as we know, Sir Nicholas is still a member of the Conservative Party. One suspects that Hannan, in making his comparison, has struck a very tender nerve, but one also suspects that he is not very far from the truth. Arbitrary use of power, after all, is one of the defining characteristics of a totalitarian regime. One event that should not pass without comment is the expiry today of one of the DowningStreet petitions calling for a referendum. This was the best supported of the many, yet looks like fading into obscurity having failed even to reach 25,000. So ends a small chapter in the ignominious history of Europscepticism where, instead of piling in behind one initiative, all the little groupescules rushed in to create their own. Thus, we had the Farage effort, which currently stands at 6,807 (although it is still live), and the equally derisory attempt by Geoffrey Van Orden MEP, he of the Conservative Party, which attracted a mere 4,057 signatures by the time of its expiry on 4 January. Even the high profile I want a referendum campaign only (currently) draws down 35,611 “supporters”, while The Daily Telegraph petition, despite the most intensive effort by the newspaper, is stalled on "more than 100,000", and has been quietly forgotten. One can quite understand and sympathise with the strong desire of Eurosceptics to "do something" but, as we remarked earlier, this sort of activity demonstrates not strength but weakness. When it comes to fighting the Juggernaut of European integration, it is very clear that, as far as Eurosceptics are concerned, “Tactics-R-Not-Us”. One day, perhaps, we will learn that winning long-term political battles requires more than just passion, intensity and persistence. The Europhiliacs, who were never a popular movement and never attracted any significant public support for their "project", still managed to prevail. It might be a good idea to look at their tactics, and perhaps learn some lessons from them. Three days ago, The Daily Telegraph took it up big time, and then today The Times goes to town on it, after the BBC ran it yesterday on all its TV and radio bulletins. This is the great rural schools closure drama, a subject which would not usually be a theme of this blog only we did actually do it on 13 December last year, before the MSM had woken up to the issue. So much for "derivative" blogs that simply feed off the MSM! What brought us into the fray was this fight on a small scale serves as a lesson of the vital power of democracy and, as events have shown, how important it is that democratic systems are maintained. The events, as it happens, have turned out well, as the The Times headline indicates, proclaiming as it does, "Parent power halts closure of small schools". 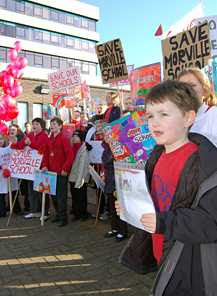 We learn from this that plans to close more than 50 village primary schools have been suspended after protests from parents, pupils and teachers that such action would devastate communities that may already have lost their local post offices and pubs. Campaigners, the paper adds, have claimed that hundreds of schools in England and Wales, some with fewer than 50 pupils, face the threat of closure because falling rolls have left them too expensive to run. 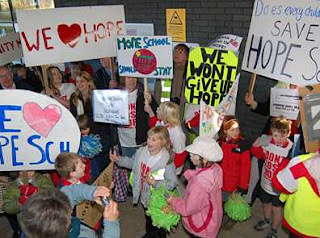 And then we come to the latest development as, yesterday, Shropshire County Council said that it was putting on hold plans to close 22 rural primary schools, after a public demonstration and passionate appeals from schools. The council will, however, proceed with plans to merge 16 other schools – a plan which is not exceptional and is, in fact, quite sensible. But, where the paper goes wrong is in pointing just to "parents, pupils and teachers", when in fact the battle was a culmination of efforts by all the local Conservative MPs, led by Owen Paterson, who called an adjournment debate which we reported in December. At the heart of the problem is a Labour government diktat which tells local authorities to close down their smaller "uneconomic" schools, many of which have surplus places, as a result of short-term demographic factors. As a central diktat, this had no regard to the fact that it would have a disproportionate effect on rural schools. These most often have catchment areas with small populations, yet provide a vital community service for which there is no ready alternative. Then we come to the local Council education department which, if anything, is a model of the EU but on a smaller scale – dominated by officials with the elected members in their thrall. 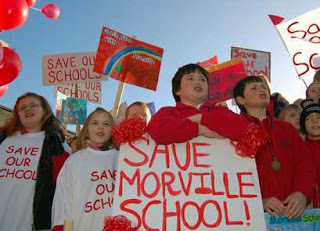 Like the good little apparatchiks they are, the officials set to with a master plan to close down 22 schools, a programme which would do massive yet save a mere £1.8 million out of a budget of £423 million, a "saving" of a mere 0.4 percent. 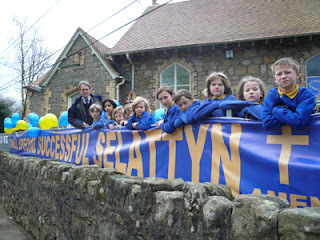 Approved by the councillors on the cabinet, this brought a storm of protest from the parents, pupils and teachers. But it was given focus and leadership by the local MPs, with local constituency association officials working behind the scenes. They were "advising" the councillors that refusal to respond to the wishes of their electorate could be highly damaging to their personal chances of re-election and could also make their Party unelectable. In the event, the pressure worked. An alliance of MPs, local party workers, parents, teachers, children – and the media – and a few sympathetic councillors, prevailed against a central diktat enforced by unelected officials who were able to control key elected members. And while the demonstrations were going on, the MPs were meeting the schools ministers Jim Knight who, stung by the raw expressions of people power and hostile media, was prepared to offer ideas to see the schools through the short-term problems. Also, he gave an undertaking to revisit the basic funding disparities which created the problem in the first place – Shropshire schools getting £337 per head less than the average in England, despite the difficulties which confront rural schools. In our earlier piece, we drew the obvious parallels between this system which is responsive to peoples' wishes – albeit imperfectly – and the "post-democratic" system embraced by the EU. The European Union may think that society can function with what it terms "participative democracy", cutting out elected representatives and talking directly to the people. But, in the final analysis, when it comes to a confrontation between the officials and the people, it is only elected representatives who can hold the officials in check – themselves motivated by the effect of their actions on their election prospects. In short, therefore, democracy does matter, and what applies at local level applies nationally as well. This, as we pointed out earlier, is what we are fighting for – and it is too important a battle to lose. Malta's parliament unanimously ratified on Tuesday the constitutional Lisbon treaty. Prime Minister Lawrence Gonzi said the treaty would give Malta a sixth seat in the European Parliament, from the current five, and that the country would be eligible for aid. Roughly translated: we get another seat on the gravy train and a bundle of dosh from the "colleagues" and they get to take over our government. We have been watching the evolving story on MP Derek Conway with more that usual interest, even if we have not yet posted on the subject as it does not fit in with the mainstream theme of the blog. The full tale can be seen unravelling on the admirable Conservative Home blog – where the readers' comments are of special relevance. However, this blog does have a direct interest in the issue. This writer's day job is a Parliamentary researcher and in that role, I have taken the (very modest) shilling from a number of MPs, all properly accounted for, recorded and tax paid. Furthermore, some of the work is funded from a sponsor who subsidises the research effort, enabling work to be done which is not funded by the taxpayer. This is also properly recorded and declared. Unlike the young Conways, no one will suggest that this work is anything other than genuine, and very hard work it is at times. That sponsorship also helps this blog keep going – in fact it is vital to it. That research then feeds into the Parliamentary process with "my" MPs (and others) often relying on the material posted to fuel questions, speeches and other work. We (both of us) also feed stuff into the MSM – not always acknowledged, but sometimes we are. Then, there is the long-term association with Booker and The Sunday Telegraph, which is apparent to anyone who regularly reads this blog. Work for Parliamentarians is not one-way. We benefit from the direct contact it gives us, the insights and the background information – as well as the more formal material such as answers to Parliamentary questions (sometimes "inspired" by us and some not), speeches, interventions and other material. It is an incredibly informal network which is mutually beneficial, to the Parliamentary process, to us and to our readers, even if they are not always aware of the sources of our material. Furthermore, this means I see MPs at first hand. The ones for whom I work I have the greatest admiration – they work incredibly hard, spending long hours not only on direct Parliamentary work but also on looking after the interests of their constituents and others, a wholly benign process that is essential in what is left of our democracy. They are backed by their unsung "assistants" who also work at a pace that I could not begin to match. That includes one of "my" MPs who employs his own wife, an incredibly hard-working lady, supremely well-educated, experienced and dedicated. If anything, for the hours she puts in and the pace of her work, she is grossly underpaid. The taxpayer is getting exceptional value for money. The problem is now, with people like Conway abusing the system, the light of the media is shining on Parliamentarians, many of whom have made perfectly sound arrangements which are wholly in keeping with their duties and responsibilities. With the current hue and cry, there is a danger that the baby will be thrown out with the bathwater. More and more rigorous controls will be demanded, which will actually circumscribe the ability of MPs to do their jobs. In this context, the demand that spouses should not be allowed to work for their partners is wholly misplaced. By and large, the taxpayer gets extraordinary value for such arrangements. 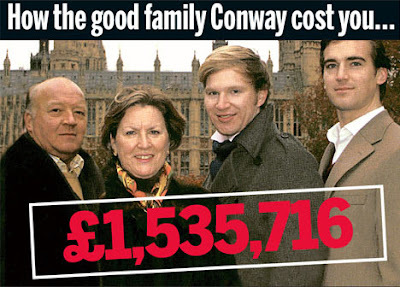 What has been missed though – or not sufficiently highlighted in respect of Mr Conway – is that if he was paying his sons for research which was not done, he, Derek Conway would not have been able to function adequately as an MP. Make no mistake, if MPs are to function effectively, then they do need a very strong research back-up. Here, there is a broader issue. In political terms, "research" is often regarded as a low grade occupation, to be carried out by low-paid minions and wannabes, passing through on their way to becoming MPs or Party apparatchiks. The same, incidentally, can be said of broadcasting, where "research" is often carried out by those at the bottom of the dung heap, a short-term job for those on the first rung of the ladder. To that extent, while it is easy to deride "overpaid" MPs and their lavish expenses, the system is actually kept afloat by a whole raft of support staff who are actually very poorly paid and, in many instances, over-worked. MPs who are trying to work within the limitations of the system are hard-put to fund a halfway decent support system. This is something that is actually overlooked. If you want decent MPs, then they have to have good support and that costs money. Far from overpaying, we are actually getting the system on the cheap. To an extent, this is what my co-editor was getting at in her earlier post. There is an alarming tendency in this country not to value intellectual effort, and a failure to recognise that such endeavour is a "product" in its own right with a very real value. If we value the democratic process, therefore, we need to look beyond the current hue and cry, and at what is actually involved. While rightly seeking to ensure that the money paid to politicians is properly spent, and rooting out the many abuses, we also need to recognise that not all of the system is corrupt. If we want good research, good policy making, and active, well-informed MPs, then that has to be paid for. And if you pay monkeys, you get peanuts. 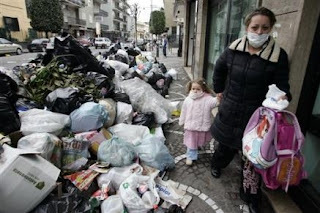 After 14 years of demonstrating its complete inability to get to grips with the problem, we are now told that the EU is threatening the Italian government with court action over its rubbish crisis. At the regular meeting of our central government today, the commissioners are due to issue a "reasoned opinion" on the matter, the final step before turning to the ECJ. Nearly a month has passed since the commission was saying that Italy was in the "last chance saloon" and now, with Naples still submerged under stinking mounds of rubbish, Rome (prop. Romani Prodi) has tried the patience of its real government to much, and provoked it into action. There are still just over 3,500 ton of uncollected garbage still clogging the streets (although how they can be so precise is anyone’s guess) - slightly down from 7,100 tonnes the previous week, when the army first began intervening in the strike. 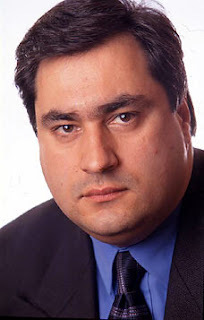 Most entertaining is the EU environment commissioner, Stavros Dimas. He, we are told, has been particularly scathing about Rome's handling of the crisis, saying that, "What we are witnessing these days in Naples is not a crisis coming out of the blue … It is the culmination of a more than 14-year-old process of insufficient implementation of European waste legislation for which Italy has repeatedly been condemned by the European Court of Justice." The great irony of this all, however, was that the Italian government declared an "emergency situation" in the region in 1994 in order to deal with the situation. It has taken this long for it not to act, and as long for the EU – which has the supreme power on this issue – to get around to acting, although it could take as long as another two years to get it to court. It is perhaps just as well that neither Italy nor the EU is running our ambulance services. Their ideas of an "emergency" seem to be somewhat out of kilter with the normal meaning of the word. Limburg isn't really part of the Netherlands. It's 3 miles to the German border (and 8 miles to the Belgian border), and France is just a short drive away. We even insulting refer to the Dutch/Dutch (we are burgundians) as "hollanders". We therefore view the affairs of our neighbouring countries with more interest than most, and are even prone to regard the affairs of our northern protestant compatriots in "Den Haag" as being somewhat alien to us. It's therefore with almost a sense of pleasure that I can report that the colleagues are perhaps not going to have such as easy time of it. What part of "No" didn't they understand? 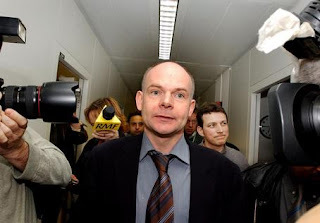 Hopefully, things will not go quite as easily for Balkenende as they appear to be going for Brown; leading opposition party SP are determined not to be "hassled" into agreement and are insisting that the text should be throughly reviewed and evaluated. Grass roots SP sentiment is however somewhat more direct: we voted 'No' last time. The text is the same (and even the flag and anthem we objected to are back in an appendix), so our 'No' still stands. We don't need a referendum, 'No' is 'No'. Meanwhile, two lawyers in France are taking the French government to court in a civil action. "The case against the decision of the French President not to organise a further Referendum, must be placed before the Court of Human Rights by 4th February, Namely, The Violation of the right of the people to free elections, which is guaranteed in Article 3 Protocol 1 of the Convention for the Protection of Human Rights and Fundamental Freedoms." 1°) The treaty was written by the intergovernmental conference. As its names says, this conference is formed with representatives of governments. Since the treaty of Lisbon is a law, it should have be written by a legislative body. In order to choose its representatives to this intergovernmental conference, European countries should have therefore organized elections before the convocation of the intergovernmental conference. By not doing so, European countries break the right to free elections as stated in article 3 of protocol 1. 2°) The treaty is not readable -no official consolidated version exists even now- and the refusal of a referendum for its ratification aims to prevent citizens to give freely their opinion about it. These are aggravating circumstances of the first point because it makes impossible for people to give their opinion about the treaty of Lisbon. Citizens were never consulted about it because the Chiefs of States know that it would be rejected by several countries (all if we believe the French President Nicolas Sarkozy). The rejection of the French and Dutch voters were disregarded. The fact to intentionally avoid the free expression of people about the treaty of Lisbon is a violation of the article 3 of the protocol 1. " I guess it has little or no chance of success, but wouldn't it be a wonderful piece of irony if the EU were finally forced to obey its own rules; hoist by its own petard. 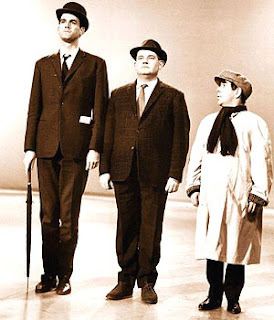 A little bit of nostalgia for those who remember those brilliant sketches of the representatives of the three classes back in the late sixties. Much has changed since then. The new ruling class are the officials and those of us who skivvy in the background are treated accordingly. We must know our places. Why did I think of this? Well, sharp-eyed readers of my posting on Memorial Days will have noticed a correction. In the best traditions of Emanuel Strobes, p.p. Lord Gnome I have to issue a correction. I have never intended to imply by word or deed that Assembly Member Len Duvall, pictured below, leader of the Labour Group in the Assembly who bears an uncanny resemblance to the young Leonid Breshnev, is a bully. He is nothing of the sort and, I hope, everyone in the Great Glass Egg will take note of this. The only reason that I may have thought this, quite erroneously, and I have now seen the error of my ways, is because of an e-mail correspondence we had after I suggested that the GLA might like to have a memorial for victims of Communism as well as one for victims of the Holocaust. I think you know what their position is and do not patronise an elected Member (regardless of party) if you are a member of staff. I am sure our readers will agree that this does not constitute bullying. After all, I know my place. Ambrose Evans-Pritchard picks up in the business section of The Daily Telegraph the extraordinary information that the ECB is pouring aid into Spanish banks to the extent that it matches the Rock rescue effort. We wrote about the dire state of the Spanish economy earlier this month, based on a Financial Times report and now Ambrose adds to this. 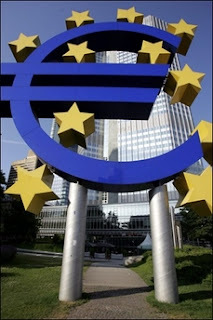 He tells us that the Spanish banks are issuing mortgage securities and asset-backed bonds on a massive scale to park at the European Central Bank, using them as collateral to raise money at favourable rates from the official credit window in Frankfurt. From the rating agency Moody, we also find that lenders had issued a record €53bn (£39bn) in the fourth quarter, yet almost none of the securities have actually been placed on the open market. Most have been sent directly to the ECB for use in "repo" operations. Ambrose cites Sandie Arlene Fernandez saying: "The market has shut down. Few, if any, of the transactions in the RBMS market (mortgage securities) have been placed since September. Some of the banks are hoping that the market will open up again but most are just preparing these deals to use as repos, which they can do since the ECB accepts AAA-rated securities." With the total volume of securities issued since the credit crunch began to bite in July having reached €63bn, it seems that only the ECB is keeping the mortgage sector afloat. The data, adds Ambrose, appear to confirm suspicions that the EU authorities have carried out a covert rescue of the Spanish mortgage banking system. It may equal the taxpayer rescue of Northern Rock in Britain, and possibly exceed it in proportion to the overall size of Spain's economy. A veiled method is necessary since the eurozone lacks a clear-cut lender of last resort. The IMF has warned that this gap in the architecture of of the single currency could prove serious in a crisis. Traders say the Spanish authorities are quietly turning a blind eye to use of the ECB window, and in some cases may be encouraging banks to go to Frankfurt - a claim denied by the Bank of Spain. The size of the Spanish corporate sectors financial deficit is truly is really scary. It rose to 14.5pc of GDP in the third quarter of 2007 from 10pc in the first quarter. This must be a record for a relatively large economy. Clearly this is not sustainable. Cost imbalances have a nasty habit of unwinding, quickly and very painfully. And guess what! Mr Owen said Spain was acutely vulnerable since it cannot cut interest rates or let the currency slide to cushion the downturn. "Several years of no growth could now beckon. It will be very difficult for the economy to pick itself up again inside EMU," he add. Well, it may not be headline news, but Spain in definitely in the mire. And, if the euro cannot be blamed for all its woes, it certainly is not helping. …the political oligarchy is not passionately pro-European. It lacks a political language or any ideals that might give Europe some meaning. That is why those who celebrate and uphold the EU are not necessarily pro-European. National governments are happy to participate in the EU because it relieves them of the need to take direct responsibility for many policy initiatives and measures. Frequently, they can shrug their shoulders and say: well, these policies emanate from a technocratic, supra-national body, the EU. In earlier times, national governments jealously guarded their policymaking processes and prerogatives. Today, they are eager to subordinate themselves to EU protocols, and to "share" authority with others. The voluntary relinquishing of sovereignty by European elites does not show that they are high-minded, forward-looking, enlightened internationalists. Or even that they are fervently pro-European. It merely shows that an insecure oligarchy is happy to work through institutions that allow it to disavow full responsibility for its actions. These are exactly the points we made in our piece in March last year. The political élites actually like the EU because it is so convenient. It does all the donkey work of governance, relieving them of the responsibility of having to work for their livings, allowing them to parade and posture on the political stage. They can spend their time indulging in the theatre of politics without having to deal with the boring details. 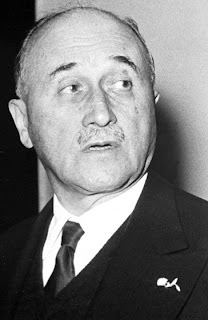 Mr Monnet (pictured) really knew what he was doing when he set this thing up. Yesterday, the House of Commons debated the motion to curtail debate on the Lisbon Treaty ratification. The vote went with the government, the Ayes 299, and the Noes 243. The guilty men and women are here. This motion is misguided and is an abuse of the House. I would normally hesitate to say this, but to my mind this sort of tactic would not have been untypical of Nazi Germany or the Soviet Union. Such a tactic is shameful and an abuse of the House. This motion seeks to limit debate to 10 o’clock tonight, which in view of its importance is quite improper. The whole country is interested in our constitutional relationship with the European Union. We are debating the timetable for that debate, so it is important that we do not curtail the debate in any way. Last night, BBC Radio 4's "Westminster Hour" at 10 pm covered the House's upcoming business, yet at no time was the EU debate mentioned. That shows, of course, the lack of publicity given by the BBC, because of its bias and probably as a result of the EU’s funding of the BBC. The soft loans and other funding amounts to some €256 million over the past five years alone. That shows the importance of our having an unlimited debate in this House, so that people in this country can understand the importance of the question. I am certainly against the motion and I urge the House to vote against it so that Members can debate the matter for as long as it takes and we can get publicity and understanding in the country on its importance. The point about the BBC is well made. Our state broadcaster is never going to bite the hand that feeds it. By tradition, all constitutional Bills are taken on the floor of the House of Commons and are never guillotined. 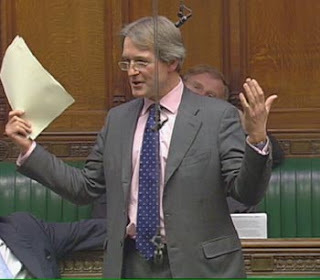 When, as Michael Morris, I was chairman of Ways and Means at the time of the Maastricht Bill, I took the chair and decided each day what amendments were in order, what topics would be debated and how long it was necessary to debate a topic before allowing a vote. I was not popular with the Government or the Opposition, but every MP had a chance to exhaustively explore the implications of the Bill. Railroading such a vital bill as the European treaty is not democracy: it is virtual dictatorship. He is not wrong, apart from splitting his infinitive. We are not living in a democracy any more. This distinctly Orwellian phrase comes straight out of the mouth of our central government. The news brought to us by the Holywood Reporter, we learn that preparatory to the "European Year of Creativity and Innovation through Education and Culture" in 2009, the EU has announced "a major study into the role of the EU's cultural industries in stimulating creativity, innovation and growth." The study, we are told, will examine the economic potential of the EU's cultural industries - from film and television to music and theatre - and look at what can be done by policy-makers to boost the sector. "Innovation and creativity are fundamental to the process of economic growth," EU culture commissioner Jan Figel said. "In our increasingly competitive, globalizing world, policy makers need to develop better, 'tailor-made' policies for the creative industries so that they can contribute their full potential to boosting Europe's long-term economic growth." 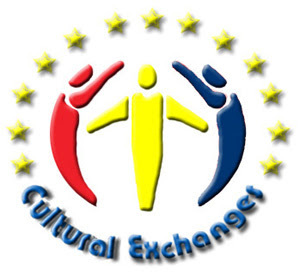 Figel also announced that two parallel expert groups would be set up over the next four months to set benchmarks for the EU's cultural policies. And it is these groups - one with government representatives, the other with NGOs – which will "attempt to set peer-review measures for EU members to meet common milestones in culture." Single European culture, here we come folks! Harmonisation makes you free. 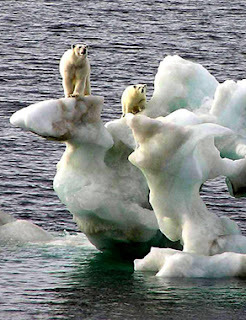 There are few more iconic images, illustrating the (supposed) effects of global warming than the photograph of an adult polar bear with its cub, apparently stranded on melting ice, miles away from the shore line. It has been used by, amongst others, snake oil salesman Al Gore and, of course, found its way into the media, not least The Daily Mail which milked it for all the emotive appeal that it could possibly extract from it. Now, from an online piece written by Carole J Williams, we get a superb dissertation on how the photographs came to be taken, how they were stolen from the original photographer and then came into the hands of Al Gore, who used them totally out of context to make a point which was not in any way supported by the material he was using. The piece is called "How environmental extremists manipulate the masses" – which, of course, they do with a little help from their friends in the media. It is well worth a read. The photographs themselves – or their use - are a classic example of framing, about which we wrote last year, and demonstrate how it is the context imposed on material rather than the material itself that conveys the message. One can only applaud the latest initiative by Open Europe, with a high profile story in The Daily Mail headed, "Britain has signed 'blank cheque' to EU as 31 powers under treaty are yet to be negotiated". The story is based on a press release produced by the organisation which states that "the full extent of the powers being handed to Brussels under the new European treaty are still to be finalised", with details gleaned from a "confidential EU paper" obtained by Open Europe. The leaked document identifies 31 areas of the Lisbon Treaty where working arrangements are not in place. The list includes the powers of a new EU diplomatic service and the extent of co-operation on defence. Neil O'Brien is cited in the Mail piece declaring that, "Much of the Lisbon Treaty is about giving the EU the power to create new institutions and arrangements and to decide on how they will actually work in practice at a later date," adding, "Many of these crucial decisions will be made by majority voting, so the UK is unlikely to be able to stop any details it doesn't like the look of. Once the treaty is ratified, there'll be no going back." There are so many deliberately unanswered questions in there - about things as important as the role and powers of the EU president and foreign minister - that MPs would effectively be signing a blank cheque to the EU if they ratify this treaty without a referendum." The details are useful but, as our own readers would doubtless agree, the underlying thrust is by no means new. Treaties are part of a process and the ratification of a new treaty is never an end in itself but merely a step which facilitates the next tranche of integration. Even now, the EU is still putting in place measures which rely on the Maastricht treaty and even the original Treaty of Rome. This then, gets to the nub of the issue and it is encouraging to see O'Brien catching up with the reality of European political integration. But where he still has not caught up is in his acceptance of the EU's own terminology, with his reference to "new institutions". As we pointed out some time ago, the very use of the word "institution" is one of those brilliant deceptions of the "colleagues", bordering on genius, which enables them to hide their intentions in plain sight. Only once you replace the word with "government" and you realise that "institutional reform" actually means "strengthening the power of the EU government" do things fall into place. Thus, what Open Europe has found out is that, armed with their new treaty, the "colleagues" are now all set to use the powers they have been given to strengthen their government, cementing its position further as our central and supreme government. The failure clearly to understand and acknowledge this has dogged the debate on the treaty, which has so often got bogged down in detail, obscuring that main and all-important issue. This is also where those who so loosely use the term "superstate" go wrong. One can have endless discussion about the meaning of the term "state", bordering on the theological, but the essence is that the EU is not a state and has no ambitions to become one. It is a government detached from the ownership of territory and its ambitions are to become a "super-government", ruling over all the states of Europe. One would like to think that Open Europe, with their latest work, are a step closer to understanding this, but it will be difficult for them. The basic inconsistency in their position is that they still project the view that it is in some way possible to reform the European Union, turning it into a construct more to their liking. But the inevitable conclusion to be drawn from their own findings is that this will never happen. The "colleagues" are not interested in Open Europe's ideas. Their only agenda is the accretion of more power until they have gained their ultimate objective, the status of that supreme government of Europe. The sooner this is recognised, the sooner the pretence that "reform" is an option can be abandoned and we can then all start concentrating on looking for an exit. In the online edition of The Sunday Times yesterday (and also picked up by Englishmans Castle), but not in the print edition (or, at least, the bit I looked at) is a story headed, "Fears of bias as BBC gets £141m in EU loans". With the pomposity for which his breed is known, Jonathan Oliver, political editor writes that, "The BBC last night faced accusations of pro-Brussels bias as it was revealed that the corporation had taken out £141m in "soft" loans from the European Union." We then get to learn that, "The broadcaster has taken out three separate low interest loans from the EU-backed European Investment Bank (EIB) to fund the expansion of its growing commercial empire. It also emerged that the BBC has received grants from the EU worth £1.4m over the past five years." One has to smile at the phrasing: "It also emerged …", confirming the MSM belief that nothing is "news" until they have written about it. Going back through the archives of this boring, trivial little blog, however, we find that we wrote about this on 24 June 2004 and again on 11 July 2006. The first piece was in response to a question from Lord Stoddart of Swindon, which established a remarkable number of loans and payments, while we established that BBC Worldwide Limited had opened up a loan facility of £25 million from the European Investment Bank, "to finance the expansion of BBCW's investments in BBC's new productions over the period 2002-2004". We also established from the BBC's own annual accounts that the EIB had made two loan facilities available to "BBC Commercial Holdings". The first, was for an amount of £66 million, available for drawing until March 2005 and had either be repaid in full as a single repayment by March 2013 or on an amortising basis by March 2015. The second, which was the one for £25 million, then available for drawing until November 2003 and repayable in one single instalment by November 2007. To be fair to the MSM, the second reference was picked up by The Guardian. We then saw similar wording: "It has also emerged …", this time the fact that the BBC had applied at the beginning of June (2006) for a further loan of up to £75m to cover investment in "new content productions" and the "development of related spinoffs" for its commercial subsidiary, BBC Worldwide. The piece also noted that the EIB is the EU's "long-term financing institution" and describes its aim as providing "finance capital investment" to further "European integration by promoting EU policies". Then cited was Philip Davies, the Conservative MP for Shipley, speaking at the culture, media and sport select committee hearing on the BBC annual report. He asked how the corporation could remain impartial on the sensitive political subject of Europe if it took EU money. "How does the BBC claim to report on matters of the EU objectively when it has received loans from this particular institution?," he said. Late on the case but better late than never, The Sunday Times declares that the Brussels deals raise awkward questions for the corporation about its coverage of European affairs and its burgeoning profit-making arm whose interests extend to property, publishing and the internet. We are told that the details of the loans and grants stretching back six years emerged in a letter written by Zarin Patel, the BBC's finance director, to Bob Spink, a Conservative MP. The first £66m loan in 2003 was used to fund "the fit-out" of a new building in the BBC's Media Village development in west London, which was later sold for a profit. The second loan for £25m and the third for £50m were made to BBC Worldwide, the corporation's profit-making arm, to pay for the acquisition of overseas rights to programmes made by the BBC in the UK. Again, also we get: The EIB has described itself as "an autonomous body set up to finance capital investment furthering European integration by promoting EU policies". Needless to say, the BBC denies that it is in any way influenced by the huge amount of cash coming its way, which is about as plausible as those who say Gordon Brown is a Eurosceptic. 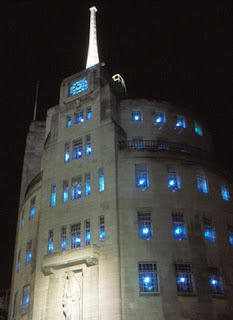 Public service broadcasting like that of the BBC, plays an important role in providing high-quality programme production. The project will sustain the international competitiveness of European audiovisual production and will also enhance demand for independent producers as they will be largely in charge of programme production. That all goes to show that the best way of keeping a secret is to issue a press release – allowing a self-important journalist nearly six years later to report: "It has emerged …". As it happens, I have already disagreed with another blogger today. No, it was not Tim Worstall who responded in a somewhat round-about fashion to my colleague’s complaints about lack of acknowledgement of the work he has done. I have done with that particular issue for the time being, though we shall both return to the problem of intellectual work not being appreciated in this country and the difficulties that creates. My disagreement, mild and courteous, as I like this particular blog a great deal, was posted on London Daily Photo, run by an amateur photographer called Ham and one of my daily must-see outlets. In fact, I cannot recommend the site highly enough. Ham, decent chap that he is, posted a picture and a comment to do with Holocaust Memorial Day. My objection was to him ruminating about “tragedies” such as Cambodia, Bosnia, Rwanda and Darfur proving that the international community still has not learnt to deal with such matters. Let us first look at that phrase, international community, which is about as meaningless as can be. Who, precisely, is going to deal with these “tragedies”? This blog has tried to document the developments in Darfur (and Chad) as well as the difficulties of dealing with them. Somehow, I suspect that a lot of people who wring their hands about the international community would not like the only possible weapon said community has being put into place: suspend aid until the governments, armies and militias start laying down arms and behaving themselves. Then stop aid altogether except, maybe, immediate help delivered by the Anglospheric armed forces and start buying goods from those countries (including oil). Moving on to more important points, I disapprove of the use of the word “tragedy” in this context. Yes, they were all tragedies to the victims, their families and their peoples but the word implies something passive. These tragedies simply happened because the international community was not looking where it was going. They did not just happen. These were also enormous crimes, even mass murders, committed by certain people for certain reasons and that must be understood. Bleating about the Holocaust as if it were some kind of an inexplicable but horrible event gets us nowhere. And talking of crimes we come to the point I actually made on the blog: Cambodia does not fit into the pattern at all. You cannot understand what happened there unless you start thinking and writing about all victims of Communism, those in the Soviet Union, in Eastern Europe, in China, in Vietnam and so on. What of them, I asked. Tomorrow morning I shall check if there are any responses. 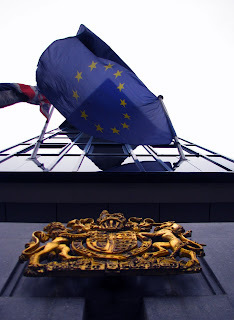 And on we go with another rant that does, eventually, explain what the connection of all this is with the European Union. No, it is not what you think. Read it here. Given the huge costs imposed on this nation from the raft of EU environmental laws, it is utterly bizarre that so many people should applaud the EU's intervention in this field. But, if anyone was in any doubt about the malign influence of the EU, all they need to do is read today’s Booker column, headed “EU plans to see our economy blown away”. The reference, as you might expect, is to the proposals for "fighting climate change" announced on Wednesday, now virtually forgotten by the MSM, despite their importance and perhaps illustrating why it is that the EU does not feature highly in public consciousness. In fact, given – as Booker illustrates – the profound effect that these proposals are going to have on our economy, this is one of those classic examples of a media besotted with local politics and issues, which simply cannot cope with the European Union. Thus, writes Booker, "It was appropriate that, just as our MPs were voting last week to hand over yet more of the power to run this country in the EU treaty, the EU itself should be unveiling easily the most ambitious example yet of how it uses the powers we have already given away." The proposals, he adds, make Stalin's Five-Year Plans look like a model of practical politics. 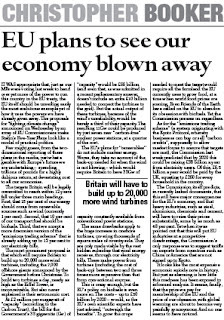 The core of the article is Booker's best estimate of the costs of the commission’s extravaganza: up to 20,000 wind turbines, at a cost of nearly £70 billion; the insanity on biofuels which will cost £50 billion; and the "emissions trading scheme" set to be raising £38 billion a year from electricity users by 2020 (of which £6.5 billion a year would be paid by the UK, equating to £260 for every household in the country). But an important secondary theme is the "two-dimensional reporting" of these plans in the media, which Booker calls, "the most expensive economic suicide note in history." Just as alarming, he says, is how little this madness has been exposed to informed analysis. It seems, finally, that the price we pay for membership of the EU and the price of our obsession with global warming are about to become very painfully synonymous. And no one seems to have noticed. However, one aspect of this excursion into fantasy economics has come to the attention of The Sunday Times which has suddenly woken up to the fact that, "Wind farms turn huge profit with help of subsidies". According to Jonathan Leake, the paper's environment editor, lavish subsidies and high electricity prices have turned Britain's onshore wind farms into an extraordinary moneyspinner, with a single two megawatt turbine capable of generating £500,000 of pure profit per year – comprising electricity sales worth £200,000 on the wholesale markets - plus another £300,000 of subsidy from taxpayers. Through this means, "climate change" has become a huge rip-off with developers climbing over each other in their rush to apply for new wind farms. 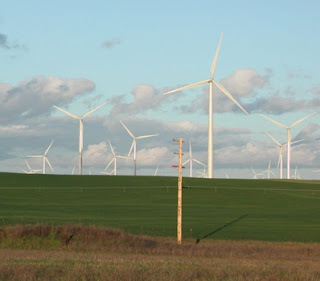 There are already 165 wind farms operating 1,944 turbines in Britain but another 34 are under construction, a further 118 have planning consent and 220 are under consideration. But for Conservative Home, we would have missed it completely (they nearly did) – but yesterday there was an ICM poll published in The Guardian which explored the electorate's views on the European Union. The strap gives you a taste of the findings, it declaring: "Poll finds support rising for EU membership." And, by the way, it also reports Labour polling up a point to 35 percent, with the Tories down two to 37 percent, giving Cameron a minuscule two percent lead – albeit in a poll that tends to favour Labour. As to the substance of the Guardian's report, it claims that the poll shows that support for Britain's EU membership is rising, not falling. The majority, at 58 percent say it is good, against only 35 percent who say it is bad for Britain, an 11-point rise in support since 2001, when ICM last asked the same question. Opposition has also risen, though, suggesting views have hardened on both sides. The paper concedes there are doubts about the constitutional Lisbon treaty, which has "few friends". Only 10 percent of voters think it will make things better for Britain, including 16 percent of Labour supporters. The trouble is, only 28 percent of all voters think it will make things worse. Of greater concern, the largest group, 50 percent, think it will make no difference one way or the other, allowing the paper to suggests that public opinion is largely indifferent to the current debate at Westminster and Tory attempts to force the issue will not get far. Predictably, Labour supporters remain the most strongly in favour of the EU, with 76 percent backing EU membership. Lib Dims come in at 66 percent in favour, while the Tories are all over the place. There, a majority of 54 percent of those who voted Tory at the last election oppose membership. By contrast, 52 percent of current supporters back the EU. Yet, despite all this, 67 percent of voters now think that Britain's identity is being lost, against 58 percent in 2001. A majority of 52 percent now also agree that the EU makes decisions in an undemocratic way, against 44 percent previously and only 45 agree that the EU increases Britain's global influence as opposed to 50 percent who disagree. That is offset by the 73 percent who now think that the EU makes it easier to live and work abroad and the 58 percent who think the EU helps create a cleaner environment, against 39 percent in 2001. Some 54 percent agree it is good for British jobs and trade, against 41 percent who think otherwise. So much for the ICM poll – and what really stands out is that the predominant response is one of indifference. Here, we can allow ourselves a little preening. Only yesterday morning, we noted in respect of the treaty that, "There simply is not the public outrage out there which will sustain a popular movement." One of Conservative Home’s commenters has got it right, hazarding the view that, "The BBC's relentless pro-EU propaganda may explain this a little, but lack of leadership by those who want our country to be a free sovereign nation again may be more to blame." Developing that sentiment, we have seen and reported consistently, the failure of the media to engage with EU issues. More to the point, when the EU does mess up, its failures are neither recognised nor reported by the media, insulating it from adverse reaction from the population. In terms of lack of leadership, this is clearly evident in the attitude of the Conservative Party, but also evident in the Eurosceptic movement as a whole which has never shown any coherence or agreement on a "line to take", as one sees with the Europhiliacs. Looking on the bright side though, the process of integration has mainly concentrated on measures – the Single Market and all that - which have affected the business community but largely left the broader population untouched. With the constitutional Lisbon treaty though, as Booker shows today, the EU is getting more and more involved in our daily lives, and the effects of its dire, incompetent rule will be harder to conceal. For sure, the inadequates in the media and the political groupies will continue to ignore the "elephant in the room" but, as comments on the Telegraph website showed yesterday, there are a lot of people out there who are brighter and more aware than the prattling classes. With greater intervention from the EU, their awareness can only increase and the numbers opposing the EU will swell. Let the Guardian indulge in its own brief preening. Our time has yet to come - but it surely will. One really ought to get worked up about the government's attempts to guillotine the debate on the European Union (Amendment) Bill, as indeed does The Daily Telegraph with an admirably well-informed report. This is backed up by a trenchant leader, complaining that Brown, having promised "the fullest possible parliamentary debate" is now reneging on that promise and seeking to close down the debate. In strict terms, though – if the guillotine goes through – this will not be the government's doing. MPs are "sovereign" in their own House and it is they, not the ministers, who decide on the business in the House. As the Telegraph so aptly says, "On Monday, the Commons must defeat this proposed guillotine and restore some democratic credibility to its proceedings, or the game really will be up". The trouble is, though, the game is already up. The debate is a charade. Although MPs are going through the treaty, line by line, with some trying to re-live the glory days of Maastricht by submitting hundreds of amendments, not one word, not a comma, not a full stop can be changed. The whole process is as sterile as a mule, the MPs going through the motions with absolutely no prospect of achieving anything. Of course, there are "noises off" who urge that we should be doing something, anything – no matter how costly or ineffective – to bring this issue to the attention of the public. But the brutal fact is that this battle is lost, as both myself and my co-editor have pointed out. The difference between the "do something" brigade and us, I suppose, is that when the dust has settled over the constitutional Lisbon treaty, many of them will go back to what they were doing before. Others will move on to fresher fields, and some of them rewarded with safe seats in the Conservative Party, in recognition of their sterling services to not rocking the boat "the cause". We, however, will still be there, as we were when some of the more high-profile "campaigners" were still in nappies. We are by no means alone in recognising that this is a long war and that the next step is to plan our strategy for the next phase, and the next, until we eventually achieve the victory we all so much need. Some of that was embodied in my co-editor's recent post which offers some home truths that so many Eurosceptics would like to avoid. Nevertheless, we cannot allow the current treaty to go forward without some protest and some noise, but the reality is that this is a minority pursuit. There simply is not the public outrage out there which will sustain a popular movement. And, as the economic clouds gather, ordinary people have more pressing concerns than what they see as the abstract issue of the encroaching powers of the European Union. The task is then to bring home to people the effect of our membership, the dire impact the EU has on our wellbeing and liberty. But even then they will take some convincing as long as so many of our prattling classes insist on viewing politics through the narrow prism of the national perspective, unable to come to terms with the fact that Westminster has no more significance than their local council, and that real power has drained away. An example of this comes in the Telegraph today, trailing a book written by Robert Peston, the BBC's business editor. Under the heading, "Who runs Britain?" the article asks, "Do big businesses and the super-rich, in fact, control our lives? Who or what else has a major influence on the way Britain is governed?" Not a few of the commentariat point out the obvious, the very thing that little Peston cannot cope with – the European Union. And it is not until the likes of Peston and his claque of fellow prattlers are forced, kicking and screaming, to recognise the reality that they so assiduously ignore that we will begin to make progress. This, to an extent, explains why EU Referendum is outside the circle of guilded, self-referential prattlers who indulge in their orgies of introspection about the minutia of local politics in the Westminster bubble. They find the reality uncomfortable, and this site stands as a constant reminder to them that their heads are so far up their own posteriors that they can see daylight only when they open their mouths. Therein lies the battle, forcing these people to recognise that which they are too timorous to admit, dragging them out of their comfort zones into the cold light of day where their self-important prattling is seen for what it is – the mouthings of the weak and inadequate who simply cannot cope with the real world. You can buy a print of the pic here. Beautiful it is, unspoilt it certainly is, and if it was not so cold, windy and isolated it would be much sought-after as a holiday destination. 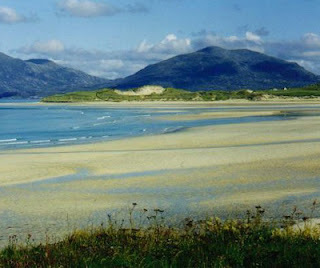 This is Lewis in the Outer Hebrides, and it is sought after for another purpose, the location of a huge wind factory, comprising 180 giant turbines, all set to help the UK fulfil the EU’s much lauded 20 percent emissions cut, and its requirement that the UK increase its renewable energy 15 percent of all energy consumption by 2020. But, according to the Hebrides News, the planning application will be refused by the Scottish government, much to the consternation of the developers and the Island Council. Hilariously, though, the reason given is that Edinburgh has "received clear warnings" from the EU that the proposal breaches a number of EU environmental laws. It is understood that EU warned that it could take action against the UK if the scheme went ahead. You just could not make this up. On the one hand, the EU is pushing for renewable energy and then, on the other, that same EU’s laws are preventing the development of that energy. Under the weight of its own contradictions will the EU eventually collapse, and this is a magnificent example of how it will be brought down. Despite our pessimism over the constitutional Lisbon treaty, the collapse cannot be long in coming. Well, just a few times. As predicted, the Italian Prime Minister, Romano Prodi has resigned after a vote of no confidence in the Senate where he had lost his majority. 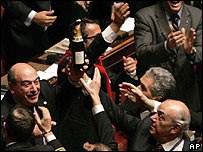 And so, goodbye the 61st Italian government since the war. Prodi was Prime Minister for 20 months, which is quite respectable. Maybe we should start getting rid of our governments that fast. Fear not. While President Giorgio Napolitano conducts emergency negotiations with interested parties to form an interim government with as much support that can be mustered among all the disparate parties, a caretaker prime minister has been appointed. His name? Romano Prodi. You may have heard it before. Now, what does this remind me of? Well there was the case of the European Commission under Jacques Santer that resigned (not dismissed by the European Parliament, as some of its members like to claim) and came back after a prolonged Brussels-type lunch as a caretaker Commission. Not so long ago when the Constitutional Reform Lisbon Treaty was being signed in the eponymous city Belgium was represented by the caretaker prime minister, one Guy Verhofstadt, who had been defeated in the previous election. His caretaker government seems to be in for the duration. In the meantime, Silvio Berlusconi is calling for a snap election under the existing rules that he introduced in his days as elected prime minister. 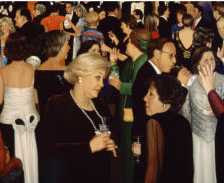 His party is celebrating as can be seen in the picture I could not resist nicking from AP. The follow-up question there would be: and do we care that there are things we do not know we do not know. First, let me deal with a seemingly small problem that has arisen and about which my colleague wrote in what I thought was a very moderate fashion (well, at first, anyway). It is related to the main theme, I promise you. The point at issue was the use of material laboriously put together by the editors of this blog, chiefly my colleague, by members of the MSM without any acknowledgement and the subsequent mutual admiration society between them, their friends and sundry bloggers. Devil’s Kitchen is excepted as are all bloggers who use our material and link back to the original. That is what the blogosphere is for and we have no desire to stop that. On the other hand, neither of us is very keen on the advice that we should shrug our shoulders and get on with life; these things happen and anyway the cause matters more than the individual. Well, that’s very nice, of course, but it is not your work that is being nobbled and we have not empowered anyone to accept apologies on our behalf. A longish piece on all these matters on EUReferendum2. Despite our little spat, we have not forgotten that Hannan does do some very useful work, his latest post picking up the dire situation in the European Parliament. In so doing, he builds on the work of England Expects, whose latest posts is a cry of despair. Both should be read. 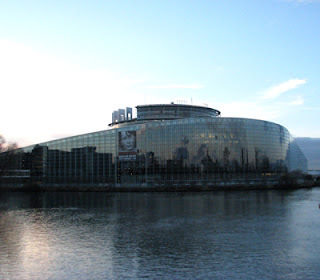 The interesting thing is that the great Europhiliac mantra is that the EU parliament is the repository of democracy in the European Union, perpetuating the myth that the election of its members necessarily confers democratic status. What Hannan and England Expects both show is that the EU parliament is simply an elected tyranny – the tyranny of the majority. And, if there is no democracy in that institution, there can be none anywhere else in this profoundly anti-democratic political construct. "It is up to all of us to demand honour and decency from our parliamentarians. If we did, they might have to live up to expectations," writes Daniel Hannan in The Daily Telegraph. How could we possibly disagree with such sterling, well-crafted sentiments, so nobly uttered by such a fine, upstanding young man? Parliamentarians should most certainly act with honour and decency. How about it Hannan? You're a "parliamentarian". I've taken some time out from writing EU Referendum posts to think about our response to the behaviour of Daniel Hannan who seems to be taking ownership of the information so laboriously gathered for this blog. I have discusssed the issue with my co-editor and we are agreed that this sort of behaviour is intolerable. That said, I've taken the opportunity to write a long post on Defence of the Realm, taking into account recent events, on a theme that I have been planning to address for some time. These posts take a lot of careful research and time, as do many of the EU Ref posts and the strain of running both blogs is now considerable. If we see any more misuse of our material, I am minded to shut this blog down and make it invitation only - or just concentrate on my Defence site. I was not put on this planet to feed the egos of overpaid MEPs. For the time being though, normal service will be resumed later this morning - maybe. Oh no, not again, I hear our readers cry. Unfortunately yes, but I promise to leave the subject alone for a little while. It has always been our contention that the fight against the EU has to be part of a fight against all unaccountable and too often corrupt transnational organizations (tranzis) that are trying to take power from the few democratic countries that exist, prevent the others from becoming democratic and impose their own governance by transnational lawyers and officials who are always nice to tyrannical kleptocrats. For once, the news is refreshingly good. Canada has announced that it will not attend the next anti-Western, anti-American, anti-Israeli, anti-Semitic hate fest, otherwise known as the Durban Anti-Racism Conference in 2009. We have written about this conference before, pointing out that the committee that is organizing it is chaired by Libya, a country that knows a thing or two about freedom and tolerance (lack of), and includes Iran, “whose President has repeatedly and forcefully called for the annihilation of Israel, proclaimed that the Holocaust was probably a joke invented by the international Zionist conspiracy and hosted an anti-holocaust cartoon festival”. Gateway Pundit published a really interesting hand-out from the 2001 conference that sighs over the fact that Hitler did not win. A similar meeting at the same venue in 2001 was marred when Israel and the United States walked out in protest over draft conference texts branding Israel as a racist and apartheid state -- language that was later dropped. 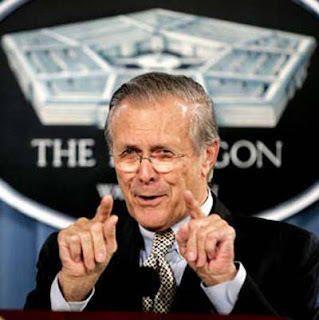 "(We) had hoped that the preparatory process for the 2009 ... conference would remedy the mistakes of the past. Despite our efforts, we have concluded that it will not. Canada will therefore not participate," Foreign Minister Maxime Bernier said in a statement. Jason Kenney, the secretary of state for multiculturalism, said the Conservative government was sure the conference would "showcase the same regrettable anti-Semitism" as the 2001 meeting. "Our government sees no value in allowing Canada's participation to continue to dignify or legitimate such hateful and un-Canadian propaganda," he told Reuters. Now there’s a secretary of state for multiculturalism one can have some time for. He clearly believes that racism is racism, no matter who expresses it and anti-Semitism is wrong, no matter how it is phrased. But African governments complained at the last conference that Western governments had chosen to highlight treatment of the Israeli issue as if it was the only one on the agenda. South Africa, the host country, stopped short of calling U.S. President George Bush a racist, saying instead that he was not "anti-racist." Other African countries were upset that Britain and the West refused to overtly apologize for their support of centuries of slavery. Well, I don’t know. I remember noting at the time that rich, spoilt, largely white middle class kids were screaming racist abuse at Colin Powell, then Secretary of State. Nor did that endless demand for an apology for slavery escape everybody’s attention. Perhaps what the British should have apologized for is abolishing the slave trade in 1807, thus depriving the Arab slavers, whom the Royal Navy fought, and certain African chieftains of their income from selling slaves. The real question is whether Canada will be supported by, at the very least, the other Anglospheric countries. The new Australian Prime Minister, Kevin Rudd, is a former diplomat, at ease with the tranzis, so one need not rely on him. The United States are going through an agonizing if entertaining election, so no decisions taken now would be binding. That may be a good reason for President Bush to make a significant gesture, especially after the ridiculous Annapolis Conference and equally ridiculous trip to the Middle East. What of our own Prime Minister? He made a half-hearted gesture over President Mugabe and the EU-Africa Summit. Will he go that extra mile and pull Britain from the Durban Conference? Oh wait, I am not sure he can. This is probably part of the common foreign policy and, as such, EU competence.